Biała Podlaska (Ukrainian: Bila Pidliaska [Біла Підляська]). Map: I-4. County city (2012 pop 59,280) on the Krna (Krzna) River in southern Podlachia in Lublin voivodeship, Poland. 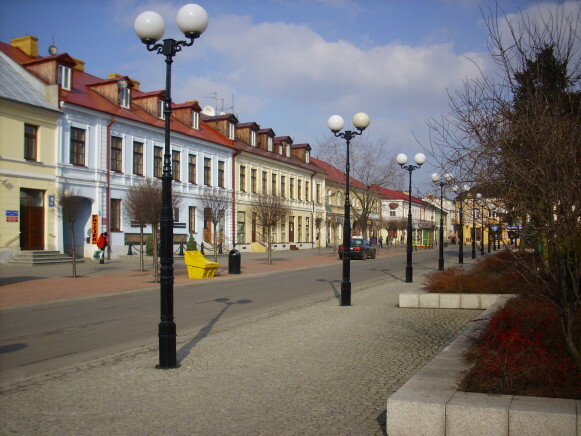 Founded in the 15th century, Biała was, from the early 1600s, a possession of the Radziwiłł family, one of the larger towns in southern Podlachia, and a center of Ukrainian religious life. It has a baroque church, the Church of SS Cyril and Methodius, which belonged to a former Basilian monastery; the relics of Saint Yosaphat Kuntsevych were preserved here until 1915. Beginning in the 1860s, many members of the Ukrainian intelligentsia were educated in the Russian gymnasium and teachers' seminary. In 1917–18 Biała was the center of the cultural activity of the Ukrainian Hromada and the center of a Bluecoats military unit; the first Ukrainian newspaper in Podlachia, Ridne slovo (1917–19), was published here. From 1940 to 1944 the Ukrainian Relief Committee was active here, and there was also a school of commerce. Until the Ukrainians were resettled in 1945–7 the eastern part of Biała Podlaska county was Ukrainian ethnic territory. The population of Biała Podlaska county consisted in 1939 of Ukrainians (16 percent), Polonized Ukrainians (kalakuty) (about 33 percent), Poles (41 percent), and Jews (10 percent).